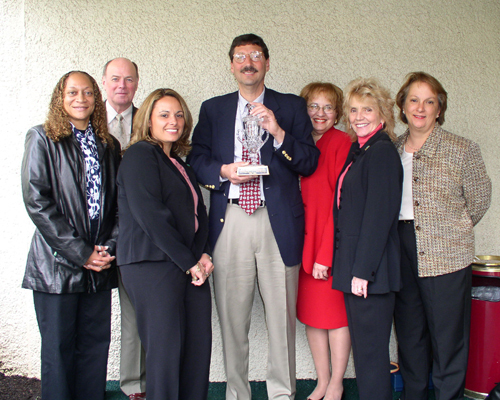 Mercer County Community College has been named the winner in the junior college division of the CAANJ (Collegiate Athletic Administrators of New Jersey) Cup, sponsored by the New Jersey Sports and Exposition Authority, in recognition of overall athletic excellence for the 2003-2004 season. The CAANJ Cup is awarded annually on the basis of points accumulated according to conference and national standings. It was the first time in the cup’s seven-year history that Mercer took home the prize at the community college level. MCCC received the Cup during the CAANJ Awards Luncheon on Thursday, October 14 at the Somerset Marriott Hotel. Cups were also presented to Princeton University (Division I, II, and NAIA) and The College of New Jersey (Division III), an all-Mercer County sweep. Simone noted that in addition to the coaching staff's commitment to student athletes, MCCC President Robert Rose is a strong supporter of the college’s athletic teams. “We have the genuine support of our administration, which makes our job so much easier,” Simone said. Among the highlights of MCCC’s 2003-2004 season was an overall combined record of 109 wins, 66 losses and one tie. Women’s basketball, men’s soccer, women’s soccer and women’s tennis teams finished as the Garden State Athletic Conference champions. In national tournament play, Mercer men’s soccer team finished second and was awarded the team sportsmanship award. The women’s tennis team advanced to the nationals for the sixth consecutive year, placing fifth, while the men’s first doubles team recorded a seventh place national finish. Among individual student athletes, four earned All American honors and 28 were named to All Region and All Conference teams. Twelve were listed among Who’s Who in American Junior College Students, and 34 second-year student athletes successfully transferred to four-year institutions after the Spring, 2004 semester. 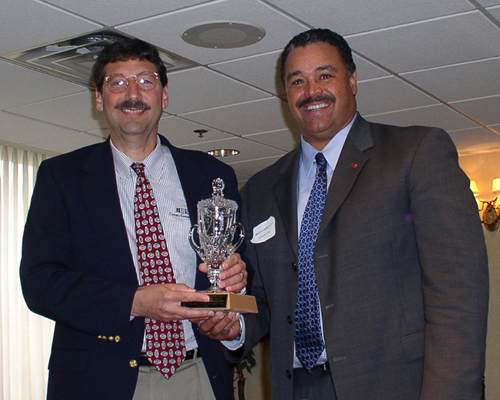 MCCC Athletics Director John Simone (left) accepts the CAANJ Cup for athletic program excellence from CAANJ representative Brian Crockett of Rutgers University during a luncheon on Oct. 14. Mercer staff at the Oct. 14 awards luncheon, from left, Regina Brown, John Wagner, Simone Morrow, Athletics Director John Simone, Dean of Student and Academic Services Diane Campbell, Peggy Schaffer, and Lisa Camillone.